The Single Wheel Rotary Harrow arena track groomer is designed for loosening up compacted soil at horse arenas and racetracks. This low profile harrow rotates in a criss cross fashion to provide complete harrow coverage. The unique turning action allows the harrow to level soil be redistributing it inward. 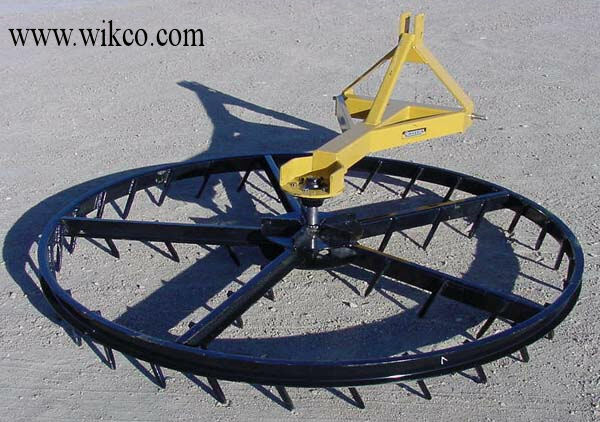 The wheel with its angled solid steel teeth slowly rotate the wheel when you pull it to give you maximum efficiency breaking up the compacted soil and leveling the surface; this rotation also allows movement of the wheel to prevent bending the harrow teeth when following the perimeter of the arena or turning sharp corners. 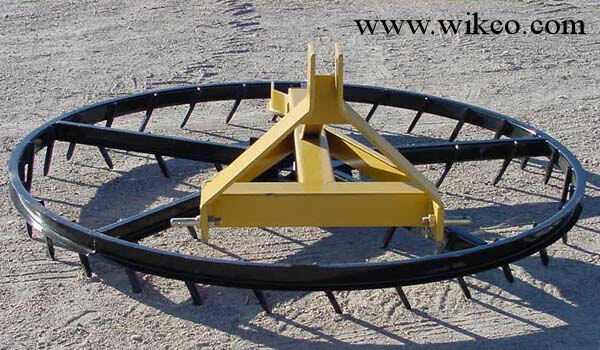 The Single Wheel Rotary Harrow is available in a 5 ft. diameter. The unit mounts on the back of your tractor's category 1 three point hitch. Available in diameterof 5 ft.